Manchester United: Is Louis van Gaal Old Trafford club's saviour? Netherlands coach Louis van Gaal is currently the odds-on favourite to fill the full-time manager's role at Manchester United following the sacking of David Moyes. The 62-year-old is keen to return to club football after the World Cup and has the credentials to get the Old Trafford side back challenging for major honours. The Dutchman was poised to take over from Sir Alex Ferguson in 2002, but is he still the right candidate to fill one of the hottest seats in football? Van Gaal is into the 23rd year of a managerial career during which he has enjoyed a wide range of success. He won the Dutch league title on three occasions with Ajax in the 1990s, and also helped the side secure the 1991 Uefa Cup and then the 1995 Champions League title, with a team that featured Edwin van der Sar, Clarence Seedorf, Frank Rijkaard and Patrick Kluivert. Van Gaal was asked to emulate that success at Spanish giants Barcelona. He inherited Bobby Robson's side in 1997 and led them to two successive La Liga titles and the Copa del Rey. His country came calling in 2000, but his first stint in charge lasted less than two years when Netherlands failed to qualify for the 2002 World Cup, the first time they had missed the competition since 1986. The Dutchman's second spell at Barcelona was even shorter - eight months - as he left midway through the season with the club hovering just above the relegation zone. Then came, what he thought, was the chance of a lifetime - to take over from Ferguson at Old Trafford. "It was before the World Cup of 2002. I was in contact with Manchester United through [then chief executive] Peter Kenyon," Van Gaal said. 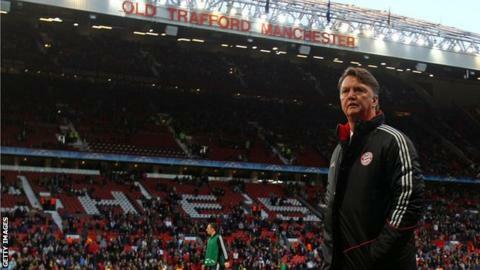 Van Gaal recovered from that disappointment and rediscovered his golden touch back in Dutch club football with AZ Alkmaar, guiding them to the 2005-06 Eredivisie before moving to the Bundesliga, where he helped Bayern Munich to the 2009-10 league title. The Dutch national side approached Van Gaal again in 2012 and this time, aided by former Ajax players Danny Blind and Kluivert, Netherlands became one of the first two European countries, along with Italy, to qualify for Brazil 2014. What have former Brazil forward Rivaldo, Dutch legends Johan Cruyff and Ronald Koeman and former Bayern Munich president Uli Hoeness got in common? They've all been riled by Van Gaal. Former Netherlands winger Boudewijn Zenden told BBC Radio 5 live that his compatriot is not a wallflower when it comes to confrontation. "I was at Barcelona and very close when the clash with Rivaldo happened," said the former Liverpool and Chelsea player. "He was winning the Golden Ball as player of the year and was playing as a left winger. Rivaldo himself thought he was better off playing behind the strikers, so as soon as he won this massive trophy he just said to Van Gaal, 'I don't want to play on the left no more. I want to play behind the strikers'. "Van Gaal said 'right that's your decision'. What followed was that he sat on the bench because the manager decided where he would play. He's one of the managers who knows how to deal with the bigger players and when he thinks something is right that's what he will do. It comes close to how Sir Alex Ferguson worked." But according to Dutch journalist Marcel van der Kraan there are two sides to the Amsterdam-born coach. "'Confrontational' is a picture of Van Gaal to the outside world," he told 5 live. "In his inside world it's about his team, the players and his fellow coaches. "To the outside world he can be blunt and funny. He is also really sharp, but he is like that to protect his players. At Bayern, Barca and Ajax, they absolutely love him." And defender Michael Reiziger, who appeared for the coach at Ajax and Barcelona, said Van Gaal adopted a "door always open" policy for his players. "I think that's one of his strong sides. He's open to everybody - you can go to him with your problems and that's why he always works with big teams," he told BBC World Service. "It's one of the biggest things that you are open with your players and you are honest with your players." Van Gaal likes his teams to play an attacking style - only Joachim Low's Germany scored more goals than Netherlands' 34 during European qualification for the 2014 World Cup. Dutch coach Raymond Verheijen, who has worked with Van Gaal and his Netherlands side, said Manchester United fans will be pleased with the brand of football the new manager would try to promote. "He is the perfect coach of the 'Dutch School' which is similar to attacking football," he told BBC World Service. "The fans can be assured that it will be a very attacking playing style." "He's an extremely good team builder, a good technical teacher. If a club wants to start from scratch and build a new team then he's the perfect candidate." However, German football writer Raphael Honigstein wrote in 2011 that the "stubborn manner" in which he imposes his tactical philosophy has not always worked. "The 4-2-3-1 formation brought the best out of many Bayern players [in his first season in charge] and gave their play a sense of identity, something that hadn't been seen in Munich for quite a while," he said. "The season after, the formation became a dogma. He never diverted from it. Not when the opposition had worked out a way to deal with, not when specific games warranted it, nor when key players were injured. Instead, players were shuffled around inside the system and often ended up in very unfamiliar positions." Asked in a 2013 Fifa interview what makes him one of the best coaches, Van Gaal said: "The philosophy. It's one that binds players with their coaches. "In my career I've found players are fascinated by my philosophy. It's an attacking, technical and tactical philosophy. "You have to play as a team and not as an individual. I'm looking to see who fits in my system - 4-3-3 - whether it is a young or old player. Age is not important." And having been away from club football for three years, Van Gaal made it clear that he is eager for a return. He added: "I think about going back to day-to-day management every day. I said I didn't like the Netherlands job in a news conference because of this. "I was a PE teacher once because of the communication I had with young people. Now I'm not committed to that. Now you only have eight contacts with players in a year - that is what I don't like."